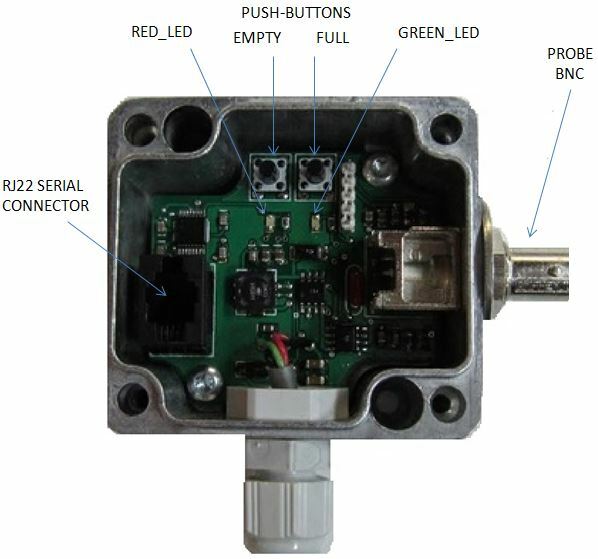 The model SSU a low-cost, highly reliable LNG Fuel Level Sending Module for capacitance probes typically used in Trucks, Buses and other LNG powered Fleet Vehicles using LNG for fuel. The SSU module interfaces between the capacitance probe located inside the LNG tank and the fuel-gauge inside the cab. The fuel-gauge will then display the LNG fuel-level inside the tank. A capacitance probe integrated inside the LNG fuel tank is the proven and reliable method for direct fuel level measurement of a cryogenic fuel or liquid. The probe has no moving parts, is immune to shock and vibration and has no components to wear out or fail. The internal capacitance probe combined with our sending module and a fuel-gauge directly measures LNG fuel level in the vehicle tank using a single coax-cable. The level is displayed inside the cab with a standard fuel gauge. The SSU was designed to be flexible for a variety of applications. No need to purchase specific modules that are factory calibrated to match a specific tank-size, probe or cable length. The same SSU module can be used in single or dual (multiple) tank configurations. TECHNOLOGY: The SSU module utilizes a RISC micro-controller that precisely monitors the LNG fuel level. Calibration values are permanently stored for the lifetime of the vehicle, even if power is lost up to 10-years! LED indicators provide visual status during set-up. FEATURES: The SSU is not specific to any particular tank size, probe length or installation configuration and does not require factory calibration. The SSU is designed to be flexible and versatile to work with a wide-range of LNG tank sizes and vehicle configurations. Making our SSU module compatible with virtually any LNG vehicle requiring a fuel-gauge. SSU-0/5-12M: 0~5V Analog Voltage Output. User can determine what signal output is compatible with their application. A signal-output & fuel-gauge combination can be recommended if there is no particular preference in the application. POWER: Wiring is standard 12V DC @ 5A, (18ga~22ga typical) for positive & ground. Module is also compatible with 24VDC input power. Module input is qualified up to 60VDC MAX input for 24VDC jump-start over-voltage (48V typical) conditions. The 3rd wire is the gauge signal. The module signal is 5 volts to the probe. 24VDC power is available with as an option. The module follows the low-voltage directive (LVD) and intrinsic-safety practices for low probe signal energy. CALIBRATION: Calibration is a simple push-button operation or EZ-CAL laptop software (free) is available to quickly set the EMPTY & FULL levels. The cab FUEL gauge needle can also be adjusted to display exactly where desired. Tolerance and needle position error that is a common issue with low-cost production automotive fuel gauges has been eliminated. Every gauge in every vehicle can be adjusted to display exactly “F” when full and “E” when empty. Calibration compensates for a variety of capacitance probe lengths (tank sizes) and cable lengths, making this ideal for all cryogenic / LNG fuel level measurement applications. No need to match the sending unit to a particular cable or probe length. This will reduce costs, eliminate purchasing headaches and inventory issues by having one module that works with every vehicle application. CAPACITANCE PROBE: A capacitance probe integrated inside the LNG fuel tank is the proven and reliable method for direct fuel level measurement of a cryogenic fuel or liquid. The probe has no moving parts, is immune to shock and vibration and has no components to wear out or fail. The internal capacitance probe combined with our sending module and a fuel-gauge directly measures LNG fuel level in the vehicle tank using a single coax-cable. The level is displayed inside the cab with a standard fuel gauge. 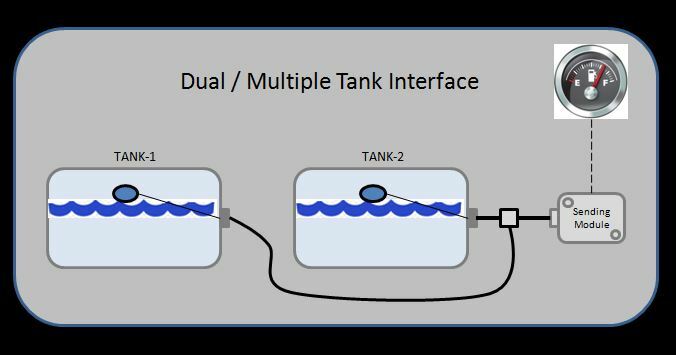 The same module can be used in single or dual (multiple) tank configurations. SIMPLE SET-UP: A serial communication port is integrated for optional EZ-LAPTOP calibration. Software is provided to display Calibration / Set-up parameters, as well as Diagnostic information. Calibration is as simple as pressing a button once the fuel tank is confirmed EMPTY or FULL. Simple calibration eliminates multiple fill-empty cycles and guesswork, saving both time and money. LED’s guide user through the calibration process and provide system status. Live data can also be displayed, providing full control over calibration, monitoring of process & level indication system status when connected to a laptop or PC. Other features such as adjustable alarm options for high & low thresholds. Pump control process with latching, adjustable fail-safe functions are also featured for process / level control & monitoring with alarms. An standard USB Serial interface adapter is required for laptop calibration. Supply Current: Approx: 120mA (33-ohm~240-ohm) FULL condition with FUEL Gauge attached), lower with alternative outputs. 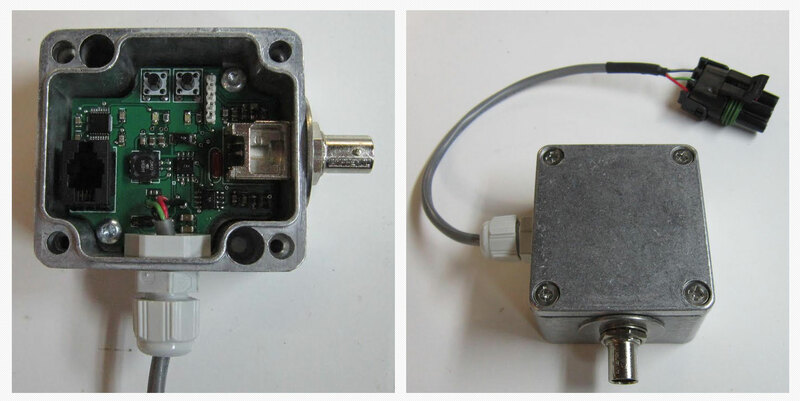 FUEL Gauge: Standard Automotive GM type, 33~240-ohm Input, 4mA~20mA current or 0~5VDC output. Capacitance Probe: Typical 100pF~1000pF, configurable to others. Other Features: Adjustable Alarm indication, Level-Control with Alarm functions. Custom probes can be designed for conductive liquid measurement such as water levels, conductive liquids / brines or petroleum based liquids.